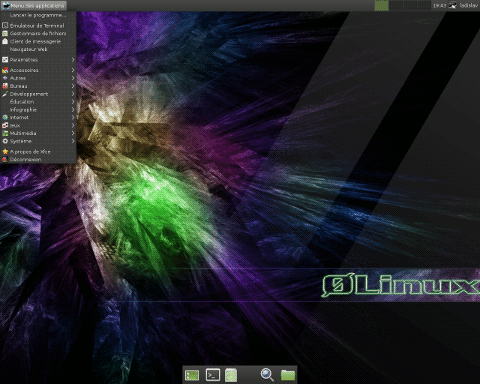 0linux is a French Linux distribution built from scratch. Designed mainly for French-speaking and moderately technical users, 0Linux provides a minimalist installation CD, a text-mode installer program, and over 1,400 packages in its online repository. 0Linux uses custom package management commands for installing (spackadd) and removing (spackrm) the distribution's *.spack packages and a separate utility (0g) for installing a group of packages and their dependences with one command. 0Linux also includes a number of home-made tools, all starting with a "0" (e.g. 0bureau for choosing the preferred desktop environment), to configure various aspects of the system. Rate this project The "Veteran UNIX Admins" have announced the release of Devuan GNU+Linux 2.0.0, a new stable build from the project that forked Debian in late 2014 to build a systemd-free variant of the popular community distribution. Devuan's second release is based on Debian 9.0 and carries a code name of "ASCII": "We are happy to announce that Devuan GNU+Linux 2.0 ASCII stable is finally available. Devuan 2.0 ASCII runs on several architectures. Installer CD and DVD images, as well as desktop live and minimal live ISO images, are available for i386 and amd64. Ready-to-use images can be downloaded for a number of ARM platforms and SOCs, including Raspberry Pi, BeagleBone, OrangePi, BananaPi, OLinuXino, Cubieboard, Nokia and Motorola mobile phones several Chromebooks, as well as for VirtualBox, QEMU and Vagrant. The Devuan 2.0 ASCII installer ISOs offer a variety of desktop environments including Xfce, KDE, MATE, Cinnamon, LXQt, with others available post-install." Read the release announcement and release notes for full details. Here are the download links to the full installation DVD, the small "netinst" ISO image and the live CD: devuan_ascii_2.0.0_amd64_dvd-1.iso (4,443MB, SHA256, signature, torrent for all discs, pkglist), devuan_ascii_2.0.0_amd64_netinst.iso (298MB, SHA256, SHA256), devuan_ascii_2.0.0_amd64_desktop-live.iso (997MB, SHA256, signature). Also available from OSDisc. Devuan GNU+Linux is a fork of Debian which uses SysV init and OpenRC in place of the systemd init software. The Devuan project has published a new release candidate for the upcoming Devuan 2.0.0 milestone. "We are happy to announce that the Devuan 2.0 ASCII Release Candidate is now available thanks to the support, feedback, and collaboration of the Devuan community. Devuan 2.0 ASCII Stable will be following soon. The Devuan 2.0 ASCII RC installer now offers a wider variety of desktop environments including Xfce, KDE, MATE, Cinnamon, LXQt (with others available post-install). In addition, there are options for "console productivity" with hundreds of CLI and TUI utils, as well as a minimal base system ideal for servers. When installing from ISO, the expert install option offers a choice of SysV init and OpenRC." Further details can be found in the project's release announcement. Devuan is available in several editions and offers builds for x86, x86-64, and several ARM single board computers. Download (pkglist): devuan_ascii_2.0.0-rc_amd64_desktop-live.iso (1,008MB, SHA256, signature), devuan_ascii_2.0.0-rc_amd64_minimal-live.iso (357MB, SHA256, signature). Devuan GNU+Linux is a fork of Debian which features the SysV init software instead of systemd. The Devuan team has announced the availability of a new development release which carries the codename ASCII: "The long-awaited release of Devuan 2.0 ASCII beta (minor planet number 3568) is here. What's new? OpenRC is installable using the expert install path; eudev has replaced systemd-udev; elogind has been added as an alternative to ConsoleKit; desktop users can choose among fully functional Xfce (default), KDE, Cinnamon, LXQt, MATE and LXDE desktops; CLI-oriented users can select the 'Console productivity' task that installs a full-featured set of console-based utilities and tools; a .vdi disk image is now provided for use with VirtualBox; ARM board kernels have been updated to 4.14 and 4.15 for most boards." Further details can be found in the project's release announcement. Devuan's beta is available in several editions, including net-install, live discs and full DVD install. There are also images for ARM single board computers and a separate set of notes for using the ARM images. Download (pkglist): devuan_ascii_2.0.0-beta_amd64_DVD.iso (4,438MB, SHA256, signature), devuan_ascii_2.0.0-beta_amd64_NETINST.iso (297MB, SHA256, signature), devuan_ascii_2.0.0_beta_amd64_desktop-live.iso (1,002MB, SHA256, signature). After approximately two years in development, the Devuan GNU+Linux project has announced the first stable release of the Devuan distribution. Devuan is a fork of Debian with the SysV init software used in place of Debian's systemd package. Services which rely on systemd to function have similarly been replaced with other software offering equivalent functionality. "Many of you might remember November 2014 when we announced that we were going to fork Debian. Well, we have done exactly that. It has been a long process, but now over two years later, we proudly present Devuan 1.0.0. There have been no significant bug reports since RC2 was announced only three weeks ago and the list of release critical bugs is now empty. As promised, this will also be a long-term support (LTS) release. Our team will participate in providing patches, security updates and release upgrades beyond the planned lifespan of Debian 'Jessie'." Additional information can be found in the release announcement. The Devuan torrent file contains all available installation media, but most torrent clients will allow users to select specific files to download. Download: devuan_jessie_1.0.0_amd64_DVD.iso (4,469MB, SHA256, signature, torrent, pkglist), devuan_jessie_1.0.0_amd64_NETINST.iso (227MB, SHA256, SHA256). Desktop live DVDs (with Xfce) are also available (SHA256, signature): devuan_jessie_1.0.0_amd64_desktop-live.iso (828MB), devuan_jessie_1.0.0_amd64_uefi_desktop-live.iso (836MB). 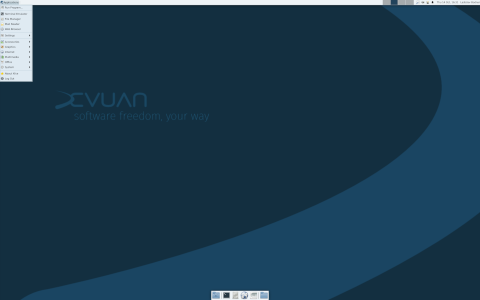 The second release candidate for Devuan GNU+Linux 1.0.0 is now ready for final testing. Devuan is a Debian fork whose goal is to provide a Linux distribution without systemd, a controversial init system that some consider unnecessarily complex, thus violating the design principles of UNIX-like operating systems. "Just two weeks after the release of Devuan Jessie 1.0.0 RC, we are happy to announce Devuan Jessie 1.0.0 RC2. Thanks to the very good feedback received from the community, this release candidate is one step closer to our final Devuan stable release and our first long-term support (LTS) release as well. What has improved in RC2? Solved issues with signing keys - all the keys used to sign installation and live images are now listed here; free and non-free firmware packages are now included in desktop-live and minimal-live ISO images; backports repository are now correctly pinned at priority 100; added a systemd-free version of NetworkManager...." Continue to the release announcement to read all the fine details. Download links: devuan_jessie_1.0.0-RC2_amd64-live.iso (832MB, SHA256, signature), devuan_jessie_1.0.0-RC2_amd64_uefi-live.iso (841MB, SHA256, signature), devuan_jessie_1.0.0-RC2_amd64_DVD.iso (4,456MB, SHA256, signature, pkglist). The Devuan GNU+Linux distribution is a fork of Debian which strives to provide a Linux distribution without systemd software. The project is now approximately two years old and has published its first release candidate. It can be adopted as an upgrade path from Debian "Wheezy" or Debian "Jessie". "This Devuan 'Jessie' release candidate is as close as we can get to a 'long term support' universal base distribution free from systemd, in the original spirit of Debian. The final Devuan 'Jessie' release will follow shortly and then we will turn our attention to 'Ascii', the current testing branch. What has improved in Devuan 'Jessie': the WiFi auto-detection problems present in the beta release series have been fixed; the problem that prevented Samba from installing has been fixed; Devuan now directly provides different base distribution flavours - desktop live, embedded, minimal live and installer ISO; Devuan's Simple Distro Kit (SDK) is rapidly approaching maturity...." Further information, along with a list of changes, is available in the release announcement. Download the desktop live image (with Xfce) or the full installation DVD: devuan_jessie_1.0.0-RC_amd64-live.iso (803MB, SHA256, signature), devuan_jessie_1.0.0-RC_amd64_DVD.iso (4,456MB, SHA256, signature, pkglist). Devuan is a Linux-based distribution which forked from Debian. The Devuan project works to make a drop-in replacement for Debian which does not feature the systemd technology. The Devuan developers have released a new development version, Devuan 1.0.0 beta 2. "After some important fixes and updates, we continue down our path of providing Debian without systemd by announcing the release of Devuan Jessie beta 2. This interim beta 2 release is another milestone as Devuan continues towards its goal of sustainability as a universal base distribution. beta 2 will be soon followed by a release candidate and the final Jessie release, due beginning of 2017." While this release is still a development beta, the developers report it should provide a safe upgrade path for people who are currently running Debian Wheezy. Further information can be found in the release announcement. Download (SHA256, signature, torrent): devuan_jessie_1.0.0-beta2_amd64_DVD.iso (4,451MB, pkglist), devuan_jessie_1.0.0-beta2_amd64_NETINST.iso (228MB).